Kelly is a brand new firefighter…and not the best one, at that. Nate is his lieutenant and always coming down on him about one screw-up or another. After a serious breach of protocol endangers not just Kelly, but another fireman, Nate has had enough. Unfortunately, yelling at Kelly is the last thing he wants to do when they end up alone in Nate’s office. 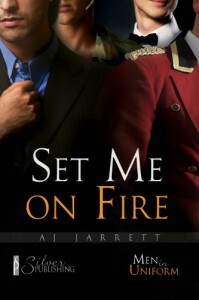 Set Me On Fire starts out strong. It literally begins with Kelly fighting for his life in a house fire. I thought the firefighter who comes to his rescue would be his love interest, but I guess AJ Jarrett thought that would be too contrived. So, when Kelly is finally safe and Nate lights into him, I was confused by intrigued. Their chemistry was hot from moment one. I love both these characters. Nate is a big ole Alpha male willing to do what it takes to get his man. Kelly is a bundle of nerves, half the time, but willing to stand up for himself and by no means a pushover. However, my favorite character is Nate’s big brother and boss, Andy. He flips from boss to brother mode as needed. It’s a shame he’s already married. There’s just enough tension to make this a nice page-turner. Nate means well, but his alpha nature is a bit much at times. And god knows Kelly might be head over heels in love, but he wasn’t taking any crap from the man. My only complaint? I wished it had been longer. These two are great together and I really appreciated peeking into their world. Personally, I really liked the fact that the emergency medical procedures were realistic. Highly recommend.